Getting there: From MoPac Expressway in Central Austin, take the 35th Street exit and head west. Proceed past Camp Mabry on the right and veer left in the fork on the road onto Old Bull Creek Road. Turn right onto Mount Bonnell Road and lumber up the the hill and look for parking on the left when reaching the crest. From the main trailhead these stairs lead to the top of Mount Bonnell. 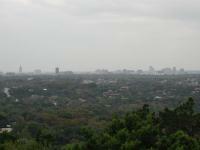 The Hike: Mount Bonnell is more of a tourist spot than a hiking destination. Nevertheless it does provide a short trail to go along with the spectacular views that draw so many people there. 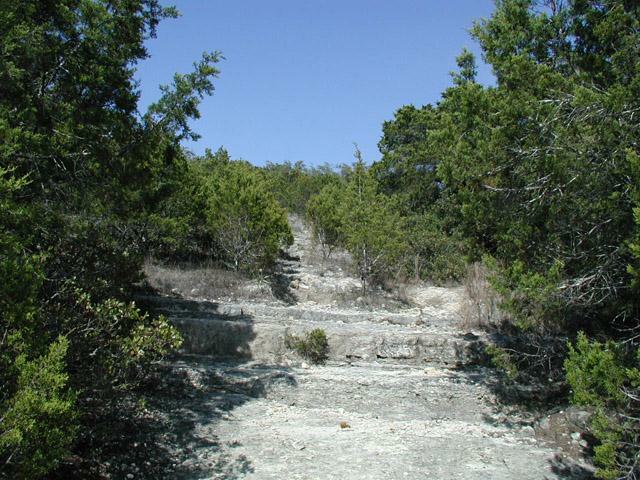 The trail begins at the stairs leading up to the summit of Mount Bonnell, marked by the waypoint "Trailhead" on the topo map. 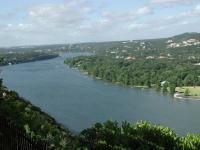 Mount Bonnell is generally considered the highest point in Austin at 775 feet, a fact which may or may not be true in the future as Austin expands in all directions. The peak is named for George Bonnell, who served as Commissioner of Indian Affairs for the Texas Republic. He first moved to Austin in 1839. 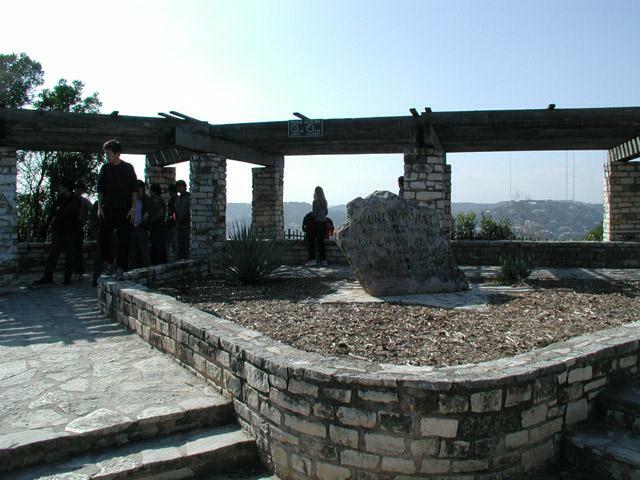 This pavilion marks the top of Mount Bonnell. it can often get crowded. Known universally as Mount Bonnell, the peak actually resides in Covert Park, a name with which few Austinites would identify. The park is named in honor of the person who provided the land on which it sits, Frank M. Covert Sr. The park was transferred to the City of Austin in 1939, exactly 100 years after the arrival in Austin of the man who provides the name for the park's peak. 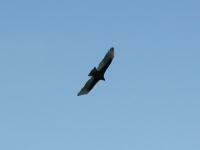 The hike is not particularly difficult - people of all athletic abilities "hike" it every day. But the initial stair climbing is a bit of a workout. This initial stretch of the trails accounts for most of the 190 feet of elevation gain encountered. 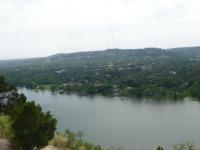 From the southern side of Mount Bonnell, looking south down Lake Austin. 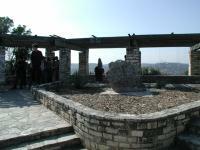 A pavilion sits at the top of the mountain offering sweeping views, particularly to the west into the Hillcountry. Downtown Austin can be seen to the southeast, but you may have to find an ideal spot in order to get a completely clear view. 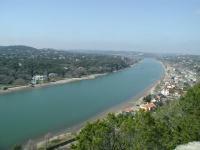 Mount Bonnell served as a popular picnic spot as far back as the 1850's. 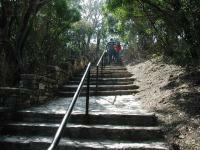 Although the trail at Mount Bonnell is short, there is quite a bit of stairs to climb, both natural and man-made. Most of the people who visit Mount Bonnell congregate here at the pavilion and along the natural rock steps to the south. The "steps" are large slabs of rock that slope downward. Some of the steps are somewhat significant and require a bit of care. A couple of different Lake Austin views are possible from this vantage point. Heading back up to the pavilion, the trail continues to the north. Like the south side, the trail here slopes downward, but the trail is composed of dirt and gravel and not the rough slabs of rock. There are somewhat fewer people here, but the views are every bit as exhilarating as those found south of the peak. The northern trail strays a bit farther from the peak than the southern spur and then makes a sharp right turn and dumps out the hiker at the northern edge of the parking area. On busier days parking here may be easier the entrance at the waypoint "Alt-TH" can be used as a trailhead. It is not a difficult hike, nor is it filled with solitude. But, it is an incredible view. I often take a picnic with me. Had not been here in a several years, looks just about the same. Lots of people out and good views of expensive houses. A good place to take visitors or noobs to Austin. Lots of steep man made stairs. The view was great at the top, but the location was crowded. Good place to take a quick hike to get a good view of the sunset.